Within a day, the reported death toll was at least 70 people. This makes it at least the third deadliest alleged CW attack in Syria so far. It's reported the dead are all or mostly civilians, and include at least 43 children. The majority of photos show infants and youths, and a few adult males. ACLOS analysis has begun, as usual working out initially on the discussion page. 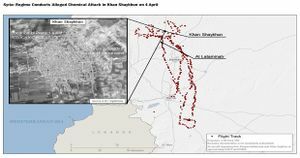 The Syrian air force dropped chemical weapons on Khan Sheikhoun, as claimed by Syrian "activist", the White House and Western media. 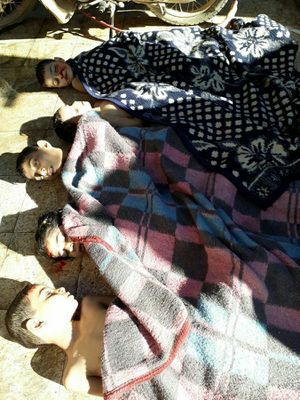 The Syrian air force hit a rebel or al-Nusra weapons warehouse storing chemical weapons or other lethal chemicals. This is the position of Russia and is also endorsed by some Americans. Rebels staged a false-flag attack, releasing lethal chemicals into the atmosphere, in an attempt to get the U.S. overtly involved on their side in the war against Syria. This is the position of much of the pro-Syria and pro-Trump community. Some even say elements of US government or Deep State were involved. No real attack happened, but the video evidence was staged by the White Helmets using actors or hostages that had been gassed in some confined spaces. This is the position of some ACLOS members who have reviewed the alleged video evidence. It is also inline with what we believe happened in 2013 in the alleged Ghouta CW attack. French Foreign Minister Jean-Marc Ayrault called for an UNSC emergency meeting. Erdogan called Putin over the event, "said such inhumane attacks are unacceptable". The Russian Defense Ministry issued a statement denying having conducted any strikes near the town. Syrian Army sources told Al Masdar News that they have flown an attack with an SU-22 on a missile factory in Khan Sheikhoun, without using chemical weapons or knowing about any stocks in the targeted factory. Syrian Deputy FM Mikdad told Syrian TV that they had a few weeks ago submitted data to the OPCW and the UN about transportation into Syria and storage of toxic substances by Nusra. Kremlin spokesperson Peskov says that Russia will provide evidence for their version to the UNSC. In the night of April 6-7, US media reports that two US warships fired 50+ Tomahawk missiles at an airbase in south-eastern Homs province in retaliation for the alleged attack they say originated at that place. The Russian Foreign Ministry issues an extensive statement on the Syrian chemical dossier on April 7. Assad in an interview with AFP published April 13 said that he thinks the story is 100% fabricated by "the West" hand in glove with Al-Nusra. Bashar al-Assad interview with RIA Novosti and Sputnik Alrossiten Published April 21. Reiterates no attack at 06:30 to 07:00. Too considered by now to be fog of war so what's the actual story? Note: Contains original video footage not seen elsewhere. Al-Arabiya reports US, UK, and France were asking for the names of any pilots involved. "Syrian Pilot Mohammed al-Hasouri, who took off in his jet from the Shayrat military airport on Tuesday morning, may have not thought that his name may be internationally listed and he will be pursued." Zaman al-Wasl gives details ob "Brig. Gen. Mohammad Yousef Hasouri, Chief of Staff and deputy commander of Shayrat airfield" and heard that he's "one of the biggest war criminals in Syria" even before the gas attack they say killed at least 103. Charles Lister on Twitter: "Reports: The pilot *allegedly* responsible for #KhanSheikhoun CW attack, Gen. Mohammed Yousef Hasouri, has been killed in an IED attack." The reports may be with Orient News, and they seem to be doubted. Some suspect the government killed him to hush up the crime. But the official said the presence of the surveillance drone over the hospital couldn't have been a coincidence, and that Russia must have known the chemical weapons attack was coming and that victims were seeking treatment. French National Evaluation Following Defense Council Meeting 26 April 2017 - Blames Syrian Government. Как «бармалеи» взрывали зарин в Сирии: глубина воронки, анализ проб и скорость ветра — расследование, also published here. This is presented as an independent journalist investigation + reporting 'from the incident location'. Authorship is not provided, but quite a lot is claimed. Crater: created by explosives places on the ground, under 10 kg of explosives (no excavation, shallow depth noted, nearby electrical box not damaged). Fig 6: It is said that al Nusra cemented the crater on 19 Apr. Chemical released. According to report, diisopropyl methylphosphonate, active sarin and hexamine were detected. Fig 7 claims to show sample collection. It is not explained who and how was collecting samples, but Fig.1 shows an area where samples were collected (as claimed). According to report, traces were detected at a distance of up to 100 m. It is estimated that 15 to 25 liters were released, with under 40 % of that airborne (30 % decomposed, 30% remained in the crater). Fatal dosage estimated to be at a distance under 55 m, secondary area up to 220 m; those areas are shown on Fig. 8. Weather/wind. According to this source, Wind speed - 1 m / s; Temperature - plus 13 degrees; Wind direction from west-southwest. The OPCW, the Commission of Inquiry, and the two teamed up as Joint Investigative Mechanism. Briefing «SYRIAN CHEMICAL DOSSIER: THE RUSSIAN VIEW» by Ambassador Mikhail Ulyanov Head of the Russian delegation in UNGA First Committee, Director of the Department for Non-Proliferation and Arms Control of the MFA of Russia on the margins of the 72nd session of the UN General Assembly, 13 October, 2017 transcript, video (see quotes, etc in talk). They determined that a Su-22 fighter bomber, which is only operated by the Syrian air force, conducted four airstrikes in Khan Sheikhun at around 6:45 am on April 4. "The Commission identified three of the bombs as likely OFAB-100-120 and one as a chemical bomb," the report said, adding that "photographs of weapon remnants depict a chemical aerial bomb of a type manufactured in the former Soviet Union." On page 29 of the OPCW report, the OPCW states it received the medical records of 247 victims from Khan Sheikhoun. Of those 247, 57 were registered as admitted to hospitals before the attack took place. Another 52 patients were admitted to hospitals between 30 and 125 kilometres away within minutes of the supposed attack time, a total of 109 patient records which are false if the purpoted attack time is true. "The Mechanism did not investigate these discrepancies and cannot determine whether they are linked to any possible staging scenario, or to poor record-keeping in chaotic conditions." The admission times noted in the records range from 0600 to 1600 hours. Analysis of the records revealed that in 57 cases, patients had been admitted to five hospitals before the incident (at 0600, 0620 and 0640 hours). In 10 of those cases (official version; in the leaked version, such cases) , patients appear to have been admitted to a hospital 125 km away from Khan Shaykhun at 0700 hours, while another 42 patients appear to have been admitted to a hospital 30 km away at 0700 hours. Based on its review of open source material showing first responders in the hours immediately after the incident, the Mechanism observed several methods and procedures that appeared either unusual or inappropriate in the circumstances. In particular, the Mechanism noted that fully equipped hazmat teams appeared at the scene later that afternoon and reported early detection of the presence of sarin, seemingly using a Dräger X-am 7000 ambient air monitor, which was not known to be able to detect sarin. Of further concern to the Mechanism was the relative unprofessionalism by which certain environmental samples appear to have been taken, e.g. sampling from a muddy puddle. They confirm that the jet could not have dropped a bomb on KS. This tweet shows a slide from the briefing, with the Pentagon's flight track and detailed calculations of the range from which the Su22 could have dropped a bomb. 1) The jet approached no closer than 5 km (citing JIM report and, in error, witnesses). Shown is 5 km radius from city center. But we know it's 5km south, or maybe less or more. My measure is 3-4 km south of the bakery crater. This extensive, German language analysis deals mostly with the media productions and the producers, relying on long-term observation of the scene and actors in Idlib province. It finds that the "citizen journalists" presenting the videos of this event are the same that are frequently on scene, and in not so prominently distributed videos in arms with the leaders of the terrorist groups Jabhat al-Nusra/Jund al-Aqsa (aka al-Qaeda) who control the region. Rusvesna military source, 7 Apr. 2017: chemical munition will have just around 100-500 g of explosives, to release chemical without destroying it. This does not appear consistent with quite significant damage to the road at the alleged crater, or destruction of a house on other photos. Also it appears that all bomb fragments were removed. (Photos in the report). After studying film and pictures of the aftermath of the Khan Sheikhoun attack, an independent Lebanese journalist claims they show the attack was faked. What makes the false flag at Khan Shaykhun unlike previous false flags is the speed with which it was exposed – both on the internet using the alleged footage itself, and possibly for the first time, by other state parties (Russia and Syria) opposed to the agenda the perpetrators seek to advance. Review at MMM blog by Adam Larson (ACLOS member Caustic logic): Points to supposed errors behind at least two of Postol's points, one at least quite serious and puzzling, but ... however flawed his overall case, when the other side is Higgins... "no clear winner except ongoing confusion"
Pentagon's location of impact crater linked to the Khan Sheykhoun chemical attack is the same as the one geolocated by @Bellingcat. 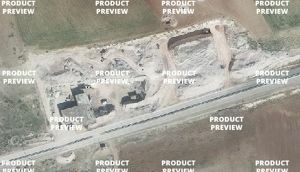 The ACLOS earth digging and cataloging commissary Petri Krohn has decided to name the White Helmets cave hospital and the likely al-Nusra Front command center centrally shown in activists videos and not unlikely geolocated to the right as Whora Hora, after bin Laden's more famous cave hideout and hospital. According to US military, as reported by BBC, US military radar systems monitored Syrian Air Force fixed-wing aircraft take off Shayrat and fly over Khan Sheikhoun on two occasions - at 06:37 local time (03:37 GMT) and 06:46, 4 April, 2017 (Zulu=UTC, Charlie = UTC+3). Low-res map and Syrian planes flight path at those times was published by multiple media sources, quoting Pentagon (reproduced on this page). As you’re well aware, Bashar al-Assad has carried out chemical attacks this past week on civilians, including women and children, and carried out attacks earlier this – last month, March 25th and 30th, in Hama province as well. We have a very high level of confidence that the attacks were carried out by aircraft under the direction of the Bashar al-Assad regime, and we also have very high confidence that the attacks involved the use of sarin nerve gas. At least the past three attacks, we have fairly high – we have high confidence on that. On September 19, it was reported Syrian or Russian warplanes bombed three hospitals in Idlib province, including Al-Rahma (the famous cave hospital, aka Whora Hora). UOSSM France tweet mentions Rahma and Orient hospital in - later tweet adds a maternity hospital in Al-Tah.] Shajul Islam lists all three. At least one bombing is shown, appearing to be quite a massive blast. As for Al-Rahma, its outbuilding (a garage?) was shown with its roof knocked down in two spots and billowing black smoke as from an oil fire. The fire must be new, but researcher Qoppa 999 shows, the damage isn't, at least that's evident; "all destruction was already there in April" ([view from inside the compound - corroborating view from street side) It seems to be in the same state it was after the noon bombing on April 4, with the roof slabs at the same angles, not even visibly jumbled by the new attack. This page was last edited on 17 April 2019, at 17:47.